Damanhur (Agenzia Fides) - A death sentence handed down by Egyptian justice against a monk and a former monk accused of the killing of Bishop Epiphanius, Abbot of St. Macarius Monastery, represents "a catastrophe" and a second appeal should be presented as soon as possible. 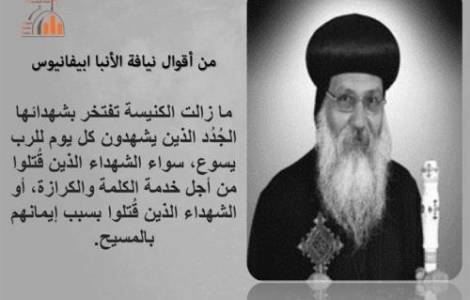 This is what Anba Agathon, Coptic Orthodox Bishop of Maghagha, said with regards to the death penalty imposed on Saturday 23 February by the Damanhur Criminal Court against monk Falta'os al Makari and former monk Wael Saad Tawadros, who were found guilty of the perpetrated murder on July 29, 2018, which shocked the entire Coptic community. Bishop Agathon also defined the day of the sentence as "a sad day", and invited to pray for the two condemned. In the sentence of condemnation we read that the two "had no qualms about committing their crime in a sacred place, and they showed that they did not even take into account the age and spiritual stature of the victim. This would have deprived the members of the court of any possibility of considering any mitigating circumstances with which to justify a less heavy sentence. The criminal court of Damanhur referred them to the Mufti of Egypt, Egypt’s top religious authority, in charge of issuing the fatwa (legal opinions based on the Sharia) on relevant issues. In Egypt, a death sentence cannot be considered definite unless approved by the Mufti. The date of the final judgment was set by the Court for April 24th. According to what was reconstructed during the investigations, the Abbot was murdered due to contrasts for economic issues and for several violations of monastic rules by the two monks. During the trial, the two accused continued to proclaim themselves innocent. The Abbot was found lifeless inside the monastery at dawn on Sunday 29 July, in a pool of blood, inside the monastery, along the way that led from his cell to the church, where the Bishop was going to start the day with the morning prayer, before Sunday Mass (see Fides 30/7/2018).